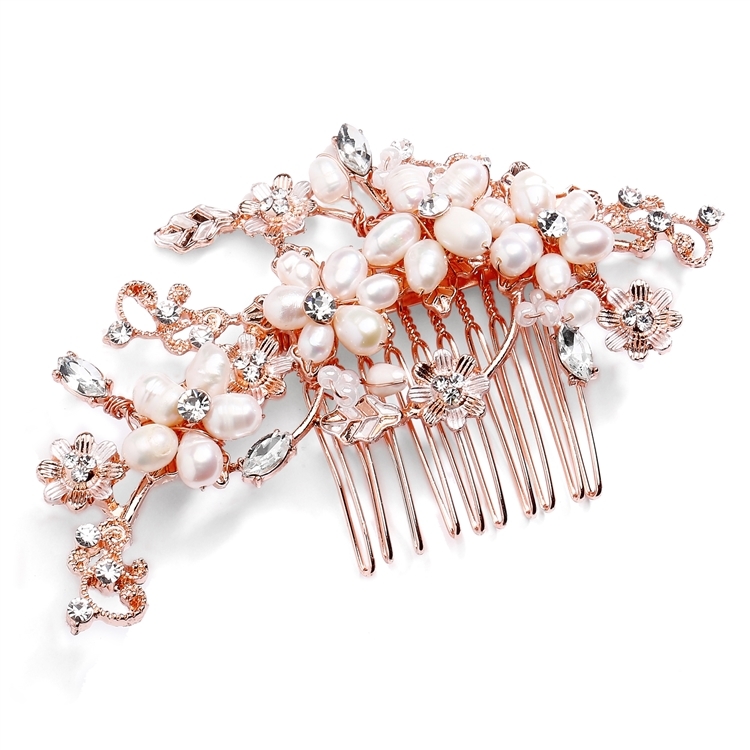 A bouquet of freshwater pearls, crystals and seed beads create this whimsical bridal hair comb with soft feminine appeal. Add floral perfection to your wedding day hairstyle with this gorgeous light silver headpiece. Our garden comb is 4 1/2" w x 2 1/4" h.
A bouquet of genuine Freshwater pearls with crystal-studded flowers create this irresistible garden-inspired headpiece with soft feminine appeal. Add floral perfection to your wedding day tresses with this gorgeous 14K blush gold plated hair accessory. We love this organic bridal headpiece worn as a dramatic side comb or nestled into a low-swept bun or updo. Mariell's romantic garden comb is 4 1/2" w x 2 1/4" h. We promise you'll love this best-selling pink gold special occasion headpiece or your money-back...guaranteed.